The iPhone is a great device, there’s no denying its innovations but the phone’s greatest competitive advantage may well be the platform not the product. A few minutes ago, Apple’s supporting “App Store” passed a billion downloads. A billion downloads in about nine months? That translates to an estimated 37 million customers (representing Apple’s disclosure for combined iPhone and iPod Touch unit sales), downloading 27 programs a piece – and with no sign of slowing down. It took Apple six months to hit 500m in January. It took only three months, to double up. Apple will no doubt promote the achievement, but even without any hype – it’s staggering. It’s hard to think of any product or service (technology or otherwise) that’s had that kind of consumer uptake in comparable scale and speed. If you assume, very conservatively, that 70% of the downloaded Apps were free and the rest sold (also conservatively) at an average price of only 99 cents, the yield is still $297m in gross revenue. At a 70/30 split, that’s $207m in the hands of developers. That’s a lot of incentive to keep them pumping out more titles. And while the remainder may not be much for Apple’s monstrous coffers, it sure is a big lure to draw customers to the iPhone. There’s a lot of utility and entertainment in the App Store (and plenty of bloat in its 35k present applications too). 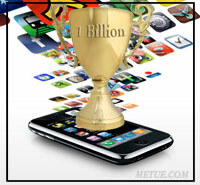 A billion downloads represents a huge lead over competitor’s efforts to create similar environments. From any vantage point a billion is an impressive feat. It’s an apples to orange comparison given iTunes doesn’t really offer free products but for perspective: it took iTunes about 34 months to achieve the same feat.